Our painting and janitorial teams have over 20 years of experience refreshing rental units for property owners and managers in Los Angeles. From touch-ups to complete paintings for walls, ceiling, cabinets, doors, etc., TSA can meet all your needs with quality work. 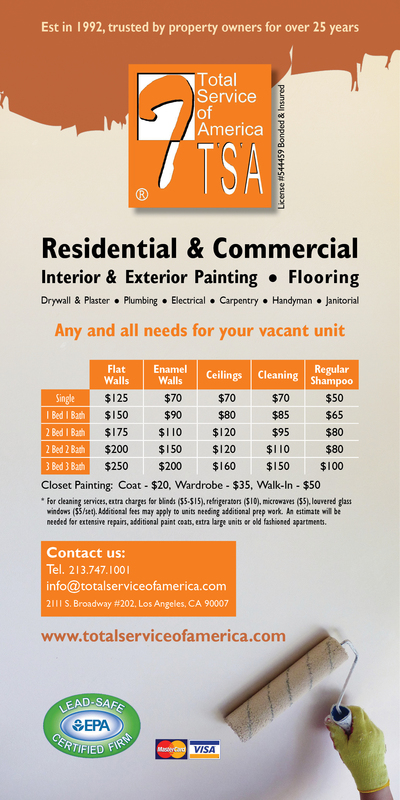 Contact us to streamline your painting and cleaning needs for newly vacant units so they can be ready for new leases. Unit Type – houses, condos, townhomes, offices, apartments, commercial-retail. Painting Needs – walls, ceilings (flat and acoustic), closets, kitchen cabinets (inside and out), balcony, porches. Brands – Behr, Dunn-Edwards, Sherwin-Williams, PPG (formerly ICI Sinclair), Shilpark are the most commonly used brands at TSA but we are happy to get any brand our clients request. Colors – TSA can provide samples from any brand and/or match the current color if a simple touch-ups are needed. Unit Type – Houses, condos, townhomes, offices, apartments, commercial/retail.